To compete more with craft breweries, Budweiser is releasing limited batches with unique twists to their flavoring and style called the Reserve Collection. Last year they released a Red Lager inspired by a recipe crafted up by George Washington that was being promoted around the Fourth of July. I enjoyed a few of these beers relaxing on my back deck listening to Detroit Tigers on the radio over the summer. Incorporating barrels that had previously held bourbon into the brewing process has been a popular trend lately with craft beers. 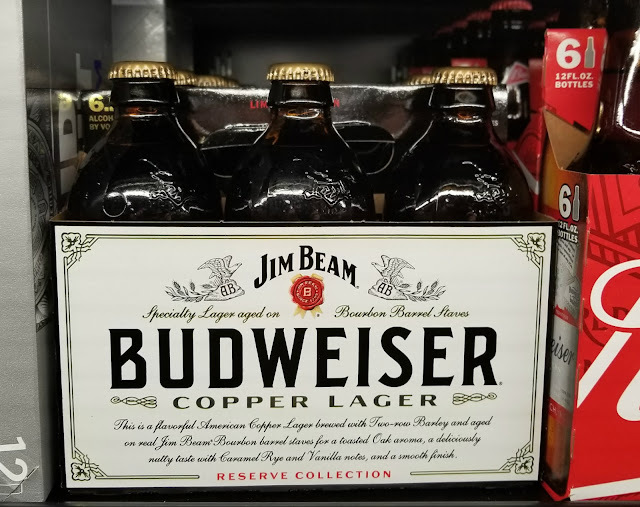 Now the King of Beers has teamed up with the world's best-selling bourbon, Jim Beam, for their own creation inspired by that craft beer trend→ Budweiser Reserve Copper Lager. This new specialty beer is available in heritage glass bottles nationwide. Copper Lager is an American lager-style beer, brewed with two-row barley and aged on Jim Beam bourbon barrel staves. The charred American oak staves, which previously served as barrels aging Jim Beam for four years, create a toasted oak aroma, while the beer has a deliciously nutty taste with caramel rye and vanilla notes and the classically smooth Budweiser finish. If this beer captures your interest, grab a six pack when you see it because when a store's supply runs out they won't be restocked. CLICK HERE to find out more about this beer and where you can find it near you.